Rina Hever has no doubt that her son Guy – an Israeli soldier missing for 13 years -will come home. 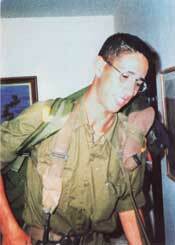 Last seen on the Golan Heights in August 1997, Guy, then 20 years old, literally disappeared without a trace. Ultimately, the government concluded that he was kidnapped by Syria. Guy Hever, 13 years ago, before his disappearance. In November, she traveled to Geneva to speak with an official from the Red Cross. She has also been to Paris, Turkey, Germany, and, this past week, to Washington. In addition, she met with officials at the United Nations in New York. “I had eight meetings in one day,” she said of her visit to Washington. “If I had more time here, I could do much more.” She added that after returning to Israel, she will plan another trip to the United States. “I received great support,” she said, noting that two years ago former president Jimmy Carter gave Syrian President Bashar al-Assad a picture of her son. Still, she added, “It’s a humanitarian case, not political. I am hoping that someone with good will” will step forward and help. “The solution of this case would be good for the relationship between Israel, the U.S., and Syria,” she said. “I believe from the bottom of my heart that the U.S. has the experience and ability” to do something. She is particularly hopeful that with a new administration in Washington, some progress might now be made. Hever does not doubt that her son is still alive. Guy, she said, had an avid interest in computers, enjoyed music, and read science fiction. Her 24-year-old twins – Shir, now studying to be a nurse, and Or, who was interviewed for this newspaper in 2005, when he came to this area to raise awareness about his brother’s plight – haven’t seen him since they were 12. The family lives in Kochav Yair, near Kfar Saba. Together with close friends and family members, Hever has done what she can, speaking regularly with Israeli government officials, traveling around the world to meet with potential contacts, and maintaining a Website, www.guyhever.com. Media attention, she said, has been fickle. In 2007, an organization called Resistance Committees for the Liberation of the Golan Heights claimed through a posting on the Internet that it had Guy and wanted to exchange him for Syrian prisoners in Israel – the first hint in 10 years that Guy was, in fact, in Syria. But after an initial flurry of press coverage, said Hever, the story once again faded from the public view.